John sat in the quiet room while thinking about how far he had come to being a football star. He could not forget how he started as a kid playing footy on the playgrounds of his Australian community. Today, though, John received multiple injuries while playing Australian football and now he had to be watching his teammates play the game he loved without any possibility of helping them because of his injuries. John had a lot of knowledge about the game and so, he had been thinking about devoting his time helping kids who were his age and who were interested in the footy game. In fact, John’s little cousin, Ray is the one who begged him to come join the other football volunteers and put his skills to good use. After careful thought, John decided to take his little cousin’s advice to get out of this depression and frustration that he was in. It took a lot of confidence on John’s part to make his way to lend a helping hand to the kids that he knew in his Queensland community. As soon as he saw this little kid with the Mark Master Training Ball in his hand, John fell in love all over again. He remembered his days as a footy player and how he mastered the game with the same Mark Master Training Ball. There was no other ball like it. In fact, John remembered training in his back yard with his brother and cousins. More distinctly, he remembered that the ball never went outside of the yard, no matter how hard they kicked it. As John reflected on his past, a smile came to his face. He got a good feeling that he had made a good decision to help those who needed the same thing he did several years ago. Ray looked up and saw John. He broke out into a run and went over to hug his cousin as the other team members looked on. “Thank you for coming, cuz!” “Glad I could help” John replied with a smile. He was now in his element. He could not wait to touch that Mark Master Training Ball again. It was the one thing that gave him confidence to be successful at the game of football and he decided that he would help these little kids to have the same opportunity that he had – but with the Mark Master Training Ball. 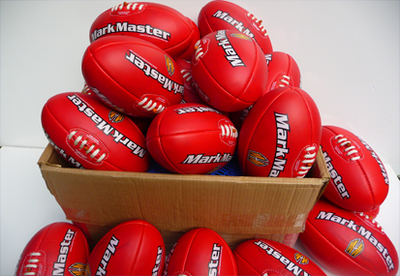 If you are a parent or kid interested in learning more about the footy game and how the Mark Master Training Ball can help you to achieve success in the AFL game, then contact That Training Ball today.